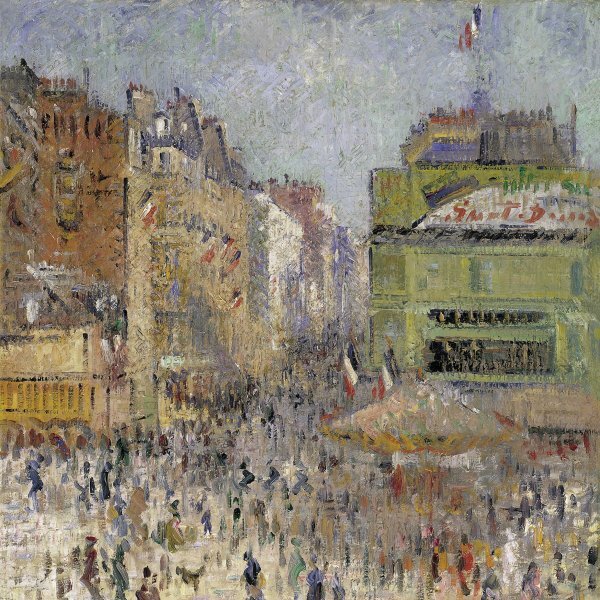 Le Sidaner's career is usually divided into an initial realist period lasting until 1893, followed by a phase linked to Symbolism (1894-1899) and an intimist period in the first years of the 20th century, up until the Great War. In the decade after the conflict, the painter created the most brilliant part of his mature oeuvre. 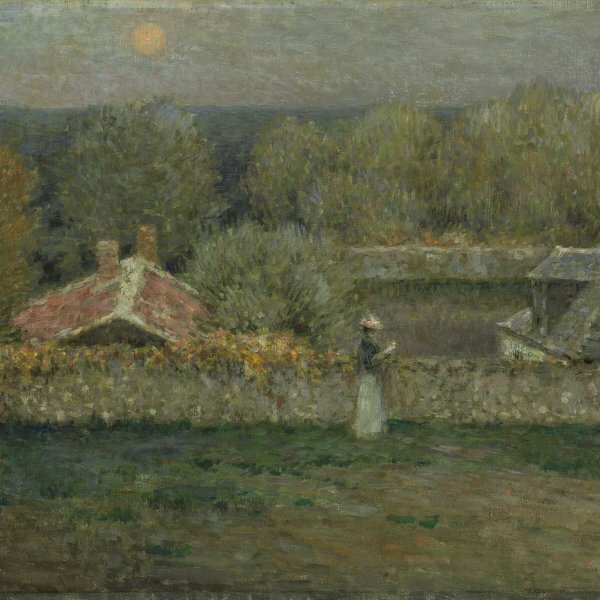 Throughout the 1920s, Le Sidaner depicted the poetic suggestions of the most varied corners of France; from his own garden in Gerberoy to the park in Versailles, from the scenery of Brittany to that of the south of France. The master of suffused colours was moving away from the hazy and diffused glow which had characterised the largest part of his works. Gradually, in his paintings light became less indeterminate, and the range of colours became brighter, more intense. Situated in the heart of the Côte d'Azur, between Monaco, Nice and Cannes, Villefranche-sur-Mer is a small town of about 7, 000 inhabitants, famous for its splendid bay. Its medieval centre, the 16th-century citadel of Saint Elme overlooking the bay, the steep narrow streets and the picturesque façades covering the whole range of ochres seduced Le Sidaner on his first visit to Villefrance-sur-Mer in 1910. But it was not until the following decade, between 1924 and 1928, that the painter stayed for a few periods at the Hôtel Welcome, in the heart of the old harbour, in order to recreate the magic of the place. One of the most picturesque streets of Villefranche is this church street, at the end of which stands the church of Saint Michel, built in an Italian baroque style, which hosts a carved wooden Christ and one of the oldest organs in the region, as well as the tomb of the Sardinian corsair Scarampo di Cairo. 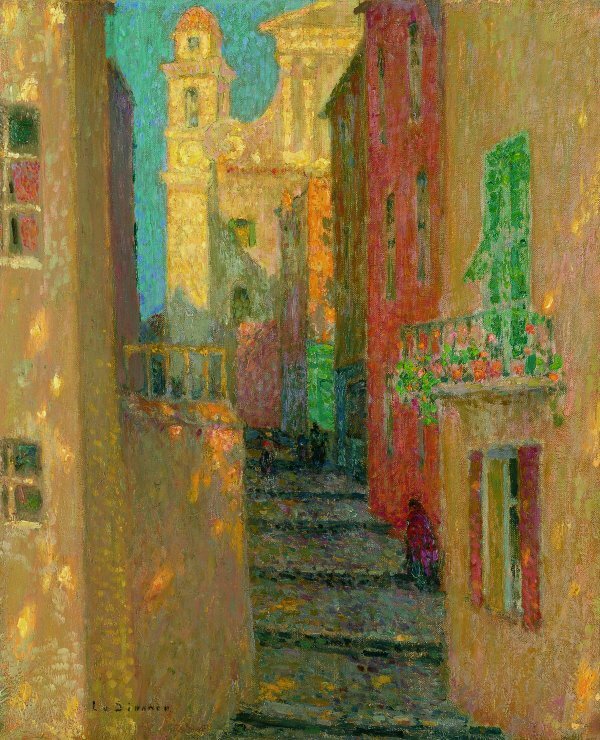 The painting radiates intimacy, with the windows and balconies, adorned with flowerpots, overlooking the narrow street. The space depicted resembles a decor, a theatre stage, with the quiet staircases, the rhythm of the parallel bands of the houses and the balconies leading the beholder towards the background, towards the façade of the church lit by the sun and the blue of the sky, which contrasts with the warm shades dominating the picture. The sketched and stooping figure walking up the street suggests a spiritual itinerary from darkness to light.